Powerful stress management techniques and mindfulness meditation for relaxation and calm. 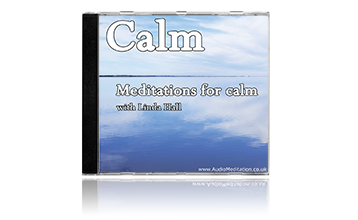 Meditation for Calm teaches you how to relieve stress and inner tensions using breathing exercises, relaxation techniques and soothing ocean sounds. Recommended for most stress related conditions and for dealing with anxiety, and may be beneficial for pain management. Anxiety and stress cause mental, physical and emotional imbalances including disturbed sleep. Most symptoms of stress are due to the body’s Autonomic Nervous System getting stuck in the ‘fight or flight’ response – a primal response originally evolved to protect us from danger. Prolonged bouts of chronic stress and anxiety may cause us to normalise and maintain this stress state, so it’s important we learn how to deal with stress better. Self-soothing stress management techniques combined with mindfulness meditation are a proven way of dealing with anxiety and how to cope with stress. The relaxation techniques for anxiety in Meditation for Calm are designed to make it easier for you to manage everyday life stress. 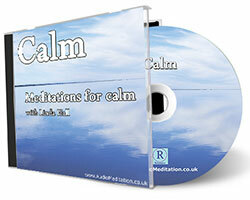 This spacious meditation CD shows you how to relax your breathing, slow your busy mind and calm your nervous system. The relaxing soundtrack includes natural sounds of the sea. People who have benefitted from Meditation for Calm include those with work/life imbalance, those suffering from CFS (Chronic Fatigue Syndrome), Fibromyalgia and other stress related conditions.